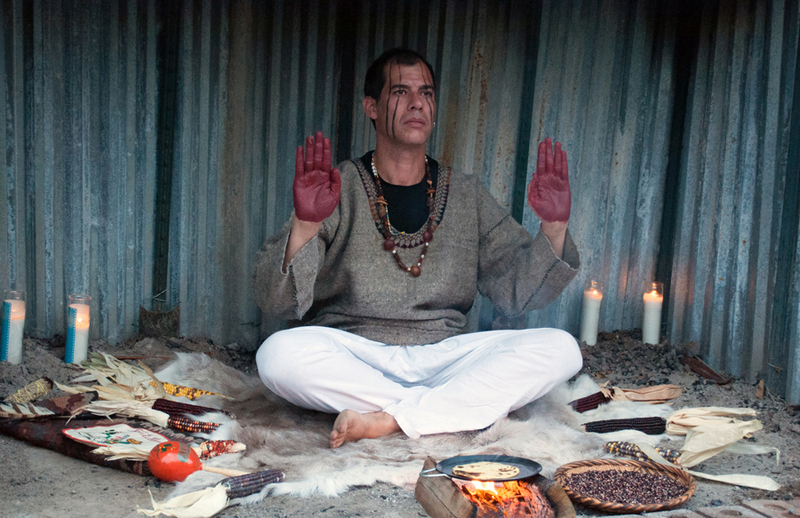 Almost accidentally, but perhaps by no accident, Jorge Rojas became the Tortilla Oracle. On a whim, and because he had to scratch a more elaborate plan for a performance he was supposed to do that day (of course the longer story involves a pregnancy and impending childbirth), he decided to read tortillas at an art event. It was a fun game that he played with friends at dinner parties over food and wine – why not try it out with complete strangers and call it art? And just like that, it happened. He became the Tortilla Oracle. Maybe it’s when we don’t notice what we are doing that we are doing our work. I remember another artist telling me, “make sure to look at what you are throwing away, because sometimes this is where your real work is.” In some ways Rojas had been tip-toeing around the role of the Tortilla Oracle for some time. His performance work brings people together, offering a space to create, paint murals, and commune. He transforms materials like an alchemist in his paintings and sculptures. He is the kind of person you feel safe to share your story. When I first heard of Rojas’ project and upcoming performance at MACLA in San Jose, I knew I had to talk to him. The project captured my imagination – both it’s silliness and earnestness. There were also similarities to the Pep Talk Squad – so I felt a sort of kindred connection to him. We are both interested in giving permission to people to be heard and seen in public spaces. But I was also fascinated with and truly inspired by the way he has embodied this role. I use this space to periodically interview artists and people who inspire me. Rojas generously answered a few questions I sent him about his project. I hope you enjoy learning more about his practice as much as I have. Susan O’Malley (SO): When I first heard of your project, the Tortilla Oracle, it immediately captured my imagination. I thought it was funny – that an ordinary tortilla could reveal some kind of truth about the self. But I also felt like there was room for seriousness within this framework. What do you hope happens through these exchanges? Jorge Rojas (JR): I think it’s great that most people chuckle or laugh when they first hear about it. Humor can provide a safe place to enter into the piece. Another thing that usually comes to people’s mind is a sense of disbelief; they wonder “Is he for real?” “Is this a real thing?” But once people enter into the work and they sit with me, they realize that I take this very seriously and am committed to what I’m doing. Not only to my performance, but also to the exchange we’re about to have. Each reading begins by creating a sacred space, which involves ritual, prayer and intent. It can be quite personal and intimate. Each reading is really a performance for and about the person sitting in front of me. We, as societies, have gotten away from making time and space for personal ritual and quietness in our lives, where we can just be with ourselves. People who practice things like meditation and yoga understand this. I’ve learned through this project that people yearn to be seen for who they are. Not the selves that we present regularly at work or in our social lives, but our deeper selves, who we really are. There have been times when I hardly need to say anything, some people immediately open up and tell me about what’s going on in their lives. People need someone who they can trust, who won’t judge them, so that they can get something off their chest or just share what they’re going through. It can be very healing. Many people don’t have that ‘someone’ they can completely be themselves with. My hope is that the Tortilla Oracle is a place for these types of exchanges to occur and that the experience continues to resonate within them well after the performance. 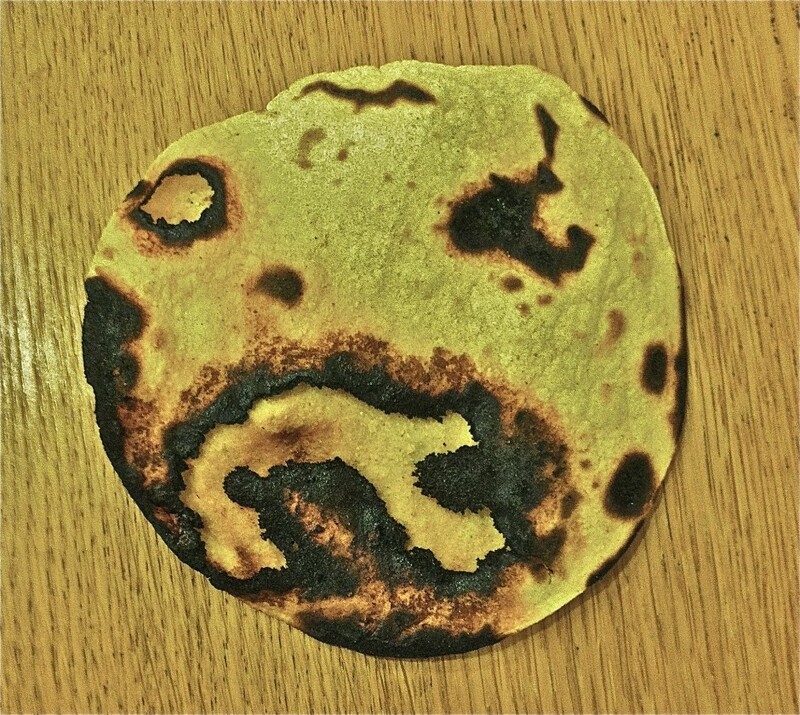 SO: You started interpreting the marks on cooked tortillas with friends at a dinner party as a game, but have since developed the persona of the Tortilla Oracle that is closer to a shaman than a party goer. Can you tell me about this transformation that’s happened over the years? JR: Each time I’m invited to perform Tortilla Oracle, a new set of opportunities and challenges arise that force me to look deeper into the history that this work is rooted in. 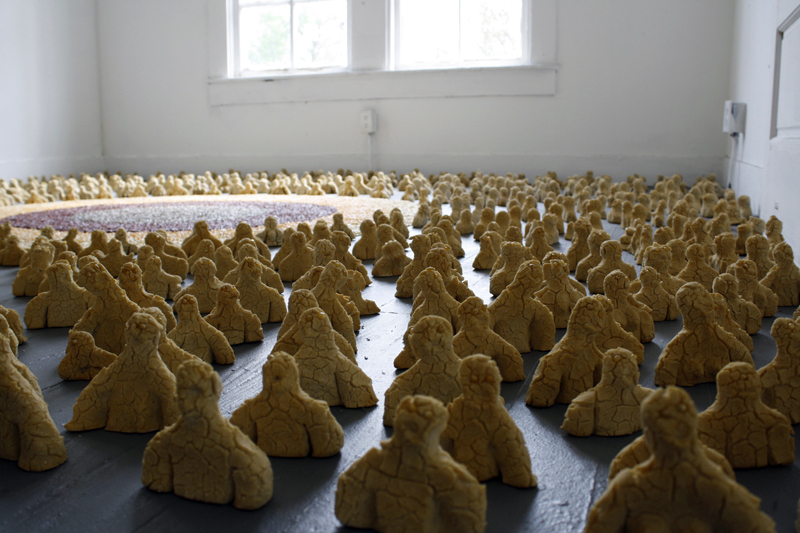 For instance, when I was invited to perform Tortilla Oracle at Project Row Houses in Houston, they said, we love the project but we’d like to invite you to propose an installation and some kind of project around the work that will involve the community further. It was really through this opportunity or challenge, that I decided to dive in and begin researching and exploring some of the ancient myths, legends, and creation theories around Corn/Maize and its uses in mystical practices. It was through this process that a larger project was born called Gente de Maiz (People of Corn). What started as an experiment in social participation and communication has evolved into a profound historical and anthropological research project. It is the kind of project that I could easily find myself researching for the rest of my life. I started performing Tortilla Oracle in 2009, and it wasn’t until this year that I began donning the ritual (face and hand) paint. I’d considered it for a long time but it didn’t feel right before. The paint is low key, I don’t want to scare or alienate anyone, but it is part of my transformation. 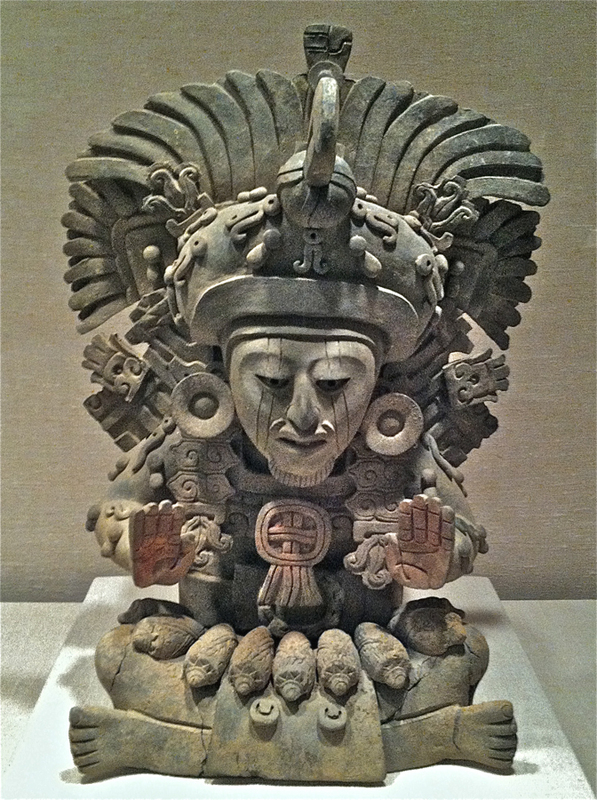 This year I was in New York City for a project and visited the Metropolitan Museum where I came across a ceramic funerary urn of a seated figure of what appears to be a shaman or healer who uses corn as his medicine. The piece is from Monte Alban, Mexico, 4th-5th Century. The moment I saw it, I instantly felt a connection. The man in the piece has two lines painted or tattooed on each side of his face and the palms of his hands are painted red and are held out in front of him in a gesture of offering. This is where I found the inspiration for my own paint. It’s a quite an interesting process initiating one’s self into a rites of passage. I’m just trying to be aware so that I notice the signs as they present themselves to me. SO: The art world is generally a pretty skeptical place; do you find it surprising that people have been so open to the project in places like museums and galleries? JR: I’ve been somewhat surprised, but at the same time I think a lot of museums and galleries have become more interested in hosting performance-based work that is ephemeral and experiential, and that can appeal to broader audiences. The Tortilla Oracle creates curiosity and that is a very good thing for museums. SO: OK, so why tortillas? JR: Most shamans and healers use some kind of object or talisman to help them divine. Whether it be cards (tarot), tea leaves, coffee grounds, smoke, I Ching coins, or in my case tortillas. These tools are used in divination to help access information that is stored in our subconscious minds, helping us to understand our selves and our place in the world and universe and getting a fresh look at the aspects of ourselves that we need to work on. Cultures throughout the Americas have long worshiped Maize as a deity of plenty. The Corn Mother, or Goddess, is often linked to renewal of life, fertility and protection. According to Aztec religion, Quetzalcoatl, “The Feathered Serpent” was the god who provided humans with their first corn to plant. Shamans of Aztec and Mayan cultures used corn as a divination tool. I’m basically taking an ancient practice and translating it in contemporary form. The tortilla is a byproduct of corn and makes it more accessible to people. I think tortillas are perfect for reading. One side represents the past as it enters the present, and the other, the present as it enters the future. The flow of energies (earth, water, fire, air, intent) is indicated by the marks made on the tortillas. At the end of the reading, participants eat their tortilla as a way of internalizing the experience. Plus, who doesn’t love tortillas? SO: So true, everyone loves tortillas! But you’re asking a half-Mexican Californian-bred corn tortilla lover. I want to hear about what’s next for the Tortilla Oracle. JR: I’ve been invited to perform Tortilla Oracle in San Jose, CA on Nov. 1st at MACLA for the opening reception of Maize y Mas: From Mother to Monster. I’m also excited to be working with Elena Garcia-Martin, Associate Professor in the Department of Languages and Literature at the University of Utah. Elena’s teaching and research areas include Performance Studies and the Contemporary Latino and Latin America stage. She approaches performance from perspectives ranging from cultural politics and identities to phenomenology and forms of knowledge production. She’s writing about ways that my performance practice combines imagination, empathy and creativity in new, transgressive, participatory ways, and how they model new ways of communication to a society much in need of self-expression and interaction. She’s interested in the Performer as Shaman, as Enactor. I look forward to continuing to present this project and to experiencing its evolution, as well as my own. SO: Wow, that sounds really exciting, I look forward to seeing what happens as well. Thanks so much for sharing your story. Jorge Rojas was born in Morelos, Mexico. He is an artist, independent curator and art educator. He studied Art at the University of Utah and at Bellas Artes in San Miguel de Allende, Mexico. He has taught mural painting and other art-related workshops throughout the New York City public school system and currently teaches Art History at East High School in Salt Lake City as part of the Clemente Course in the Humanities. His work and curatorial projects have been exhibited internationally in galleries and museums including Queens Museum of Art, New York; El Museo del Barrio, New York; New World Museum, Houston; Ex Convento del Carmen, Guadalajara; Museum of Latin American Art, Long Beach; Hemispheric Institute, New York; Utah Museum of Fine Arts, Salt Lake City; and Utah Museum of Contemporary Art, Salt Lake City. He has received grants and fellowships including National Performance Network’s VAN Residency, Experimental Television Center, West Chicago City Museum Artist in Residency Program, Vermont Studio Center, Project Row Houses, and The Creative Center’s Hospital Artist-in-Residence Program. His work is included in numerous private and public collections including The Mexican Museum, San Francisco; Museum of Latin American Art, Long Beach; and New Jersey State Museum, Trenton. Jorge is currently artist-in-residence at The Huntsman Cancer Institute. He is the Founding Director of Low Lives, an international, multi-venue online performance festival that was founded in 2009. Rojas lives and works in Salt Lake City, Utah with his wife Jenna, and sons Felix and Emiliano. This entry was posted on Wednesday, September 25th, 2013 at 4:46 pm	and is filed under Blog. Categories: Blog. 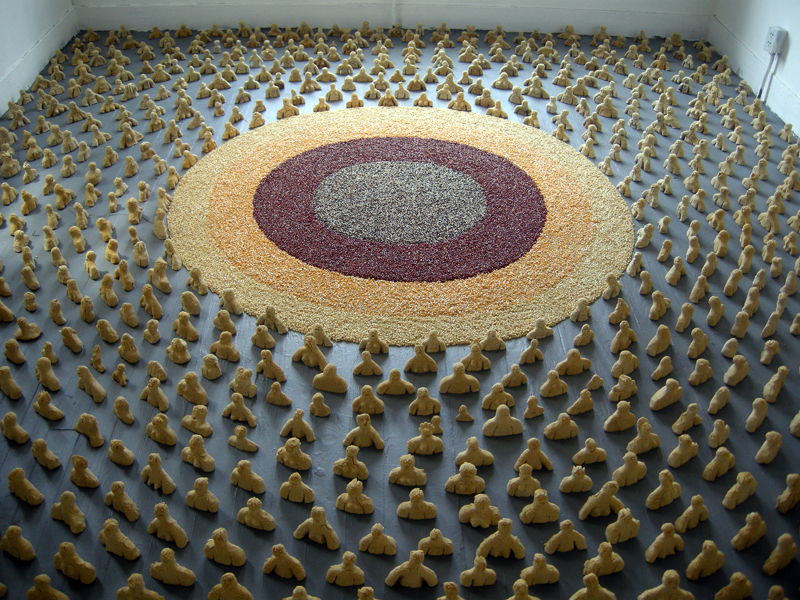 Tags: art, artist, Corn Mandala, Divination, generosity, Gente de Maiz, inspiration, Jorge Rojas, People, public space, San Jose, Tortilla Oracle, transparency, and wellness. You can follow any responses to this entry through the RSS 2.0 feed. I am impressed by the interview and ecstatic about the possibilities. I believe this practice that Jorge is now engaging in is ancient, inspired and healing. It can go very, very far, and no one could be more devoted and serious about its objective than the one that has created it through his own dedication, honesty and desire to help the world and its inhabitants. All content © Copyright 2016 by HI, I'M SUSAN O'MALLEY.